Another external graphics card dock enters the fray. The battle to bring desktop-class graphics performance to your laptop is starting to heat up in earnest. At CES in January, Acer, Asus, and Razer revealed external docks that let you connect desktop graphics cards to your notebook, and now, graphics card vendor PowerColor is jumping in on the action. The PowerColor Devil Box most closely resembles the Razer Core. It delivers desktop graphics to your laptop over a speedy Thunderbolt 3 connection with help from AMD’s new XConnect technology, which was developed in conjunction with Intel. Asus’ ROG Station X2 demands a pair of Thunderbolt 3 connections, by comparison, while Acer’s external graphics dock is powered by a mobile graphics chip that can’t be swapped out. 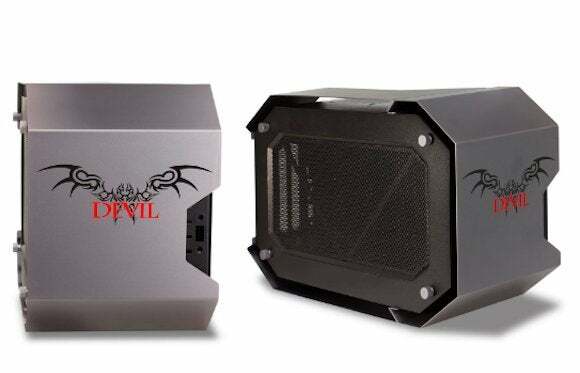 The PowerColor Devil Box lets you swap in any recent desktop graphics card under 310mm in length that uses under 375 watts of power. Ironically, while that means Nvidia’s entire GTX 900- and 10-series graphics cards are compatible with the enclosure, along with most air-cooled versions of the Radeon R300-series and the Fury lineup, PowerColor’s own hulking Devil-branded Radeon 390 and 390X graphics cards aren’t. AMD’s XConnect technology allows Radeon graphics cards to be plugged into supported laptops on the fly, while you’ll need to shut down your system before swapping in a GeForce card. In theory, the PowerColor Devil Box and Razer Core could be compatible with virtually every notebook with a Thunderbolt 3 connection. In practice, laptop manufacturers need to update their system firmware to support Intel graphics switching for these external Thunderbolt docks to work properly—at least with the Core. PowerColor’s release didn’t specify compatibility details. Currently, Razer’s own Blade laptops and Intel’s Skull Canyon NUC support the Core, and presumably the PowerColor Devil Box as well. Intrigued? Check out PowerColor’s Devil Box page for full technical details. You won’t find a price mentioned, but Razer’s Core sells for $500.